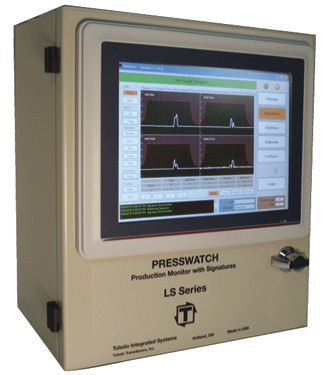 Toledo Integrated Systems, Holland, OH, introduces the PressWatch LS (rev. 2) series tonnage monitor. The 10.4-in. color-touch PC presents tonnage information and resolver-based tonnage signatures right at the press. Enveloping and Critical Curve Monitoring (CCM) are standard features. Interface the PressWatch LS monitor with the firm's PressNet 5.0 web-based software for tracking alarms and managing information.